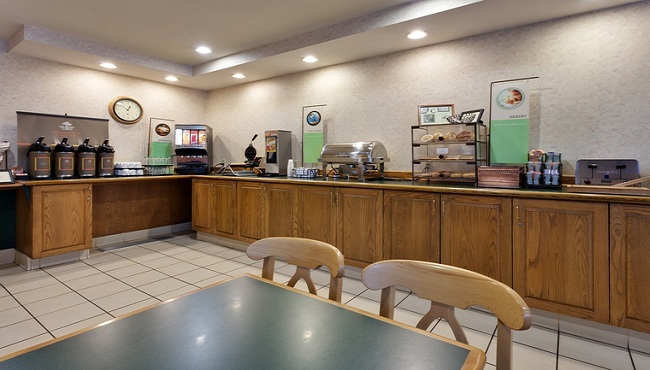 Wake up to a hearty breakfast at the Country Inn & Suites, Mount Morris, where you can make your own Belgian waffles and pair them with sausage or ham, eggs, muffins and pastries. If you prefer a lighter meal, try the kettle-cooked oatmeal, fresh fruit, yogurt, coffee and juice with an assortment of cereals. For lunch or dinner, give some of the nearby restaurants a try, like Genesee River Restaurant located next door. If you have special dietary needs, contact the hotel 72 hours before your arrival and the staff will do their best to provide kosher, gluten-free or lactose-free options.